When we were in Lancaster for vacation, I bought too much fruit. Every time we stopped by a roadside farmstand, I’d enter a fugue state in which I’d forget how much food we already had at our cabin and would buy more (it was all so cheap! and gorgeous! and fresh!). By the time we headed home last Sunday, I had a gallon-size ziptop bag full of peaches and plums that were rapidly ripening. The bumps they received in transit didn’t help preserve their quality and by the time they were back in the kitchen, they were in dire shape. At one point, my husband suggested just throwing them away. Not wanting to waste the fruit that I’d spent my vacation cooing over, I decided to make a quick batch of skillet jam. Simmered in a large, stainless pan, this jam cooks up in less than ten minutes, making it the perfect way to preserve overripe fruit quickly and without a ton of fuss. Because I never know when to quit, I always do these things in the moments before bedtime. A fresh jar of jam come morning is never a bad thing. After cutting away the bruises and moldy spots from my peaches and plums, I had 2 1/2 cups of chopped fruit. 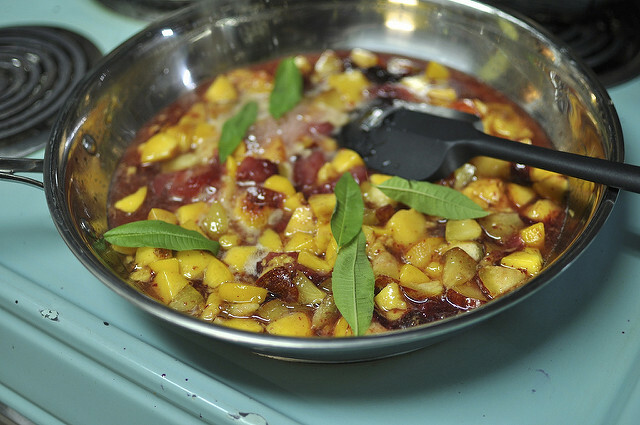 Combined with 1/2 cup honey and six lemon verbena leaves, I cooked it all together over high heat, stirring regularly until the juices thickened. The lemon verbena leaves added a nice citrus-y flavor. They don’t do anything to increase the amount of acid in the jam though, so if the jam is struggling to set up, squeeze half a lemon’s worth of juice into the pan as well. You know a skillet jam is done when you can pull the spatula through it and jam doesn’t immediately rush in to fill the empty space. Another way to tell the cooking is finished is that it develops and holds those tiny little bubbles around the edges in the photo below. When you stir it, the jam should burble and simmer feverishly. Jam always tells you when it’s done if you look and listen closely. Because it only uses honey as a sweetener, this jam tastes more of fruit than sugar which is a good thing in my book. The only downside of jamming with honey is that it doesn’t have the same preservative powers as sugar, so it won’t last for eons in the fridge. It could be safely canned for longer storage, but just I did it, it’s got about two weeks before it will start to develop mold. However, at the rate I’m eating it, spoilage won’t be an issue. 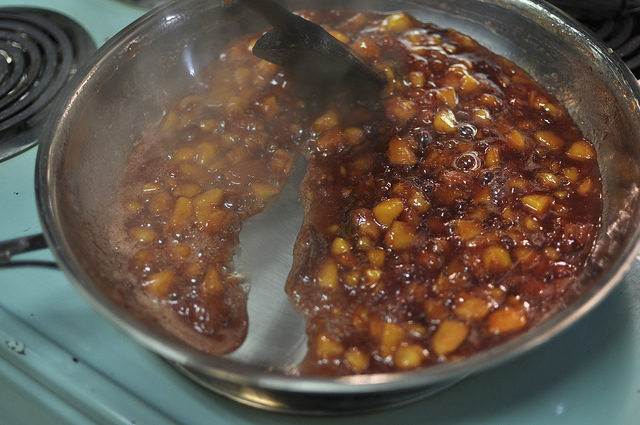 Making a skillet jam like this isn’t just limited to peaches and plums. You can do this same sort of technique with berries, pears, nectarines, apricots and more. One could also portion this jam out into two containers and pop half in the freezer, should you be the type who struggles to finish a jar. Hi, I’m a pretty new reader. Could you make a tomato jam this way? I made some using your recipe (and it worked wonderfully) but was wondering if it could be made in a smaller batch (cooking down the 5 lbs took a long time, over 2 hrs) Thanks! I’ve never tried it, but I imagine you could. You’d have to stir very regularly though, because that tomato jam can sometimes stick. This is a great recepie!! I used a fresh sprig of rosemary from our garden and a splash of concentrated lemon juice. I can’t stop eating it while spooning it into the jar, lol. Would you process this in a boil water bath for 10 minutes to be shelf storable? Yes, you could boiling water bath can it for 10 minutes. That sounds great, and I love that it’s just some honey instead of cups upon cups of sugar. Could one pressure can this jam? 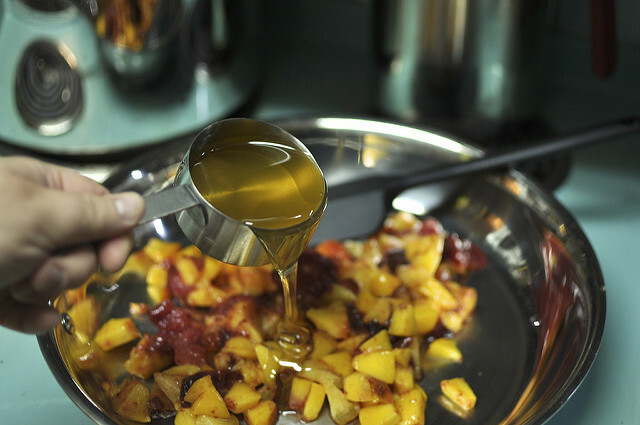 No need to pressure can jam like this, peaches and plums are plenty acidic. For longer storage, you could boiling water bath can it. Looks luscious, Marisa! Once my power comes on from the outage the storm caused, I might make some!!! Beautiful pictures, Marisa. I don’t have lemon verbena leaves. Can I use rosemary and just squeeze in lemon? Love this idea – so quick and easy! I’ve just started reading your blog a few weeks ago and am obsessed! I’ve made a couple batches of jam and I love the idea of using honey instead. Also, do you have a good recommendation on where to buy cheap canning jars? Or if I have antique jars can I use them if I sterilze them in boiling water and buy new lids? Thanks for the info, Marisa! I love this! So quick and easy. And less sugar more fruit flavor is definitely ok in my book as well. I’m surprised that honey doesn’t have the same preservative effects as sugar. Honey is extremely shelf stable, and literally no bacteria can live in it because there is very little water in it. I am going to try this with the over-ripe peaches and nectarines I have. Great idea for fruit past it’s prime! What you say about honey is true in its regular state. The problem is that once you boil honey into something, it looses much of its preservative power. Good to know! Making this right now. Can’t wait to eat it! Honey can contain spores of Clostridium botulinum, which can cause botulism and is the reason you shouldn’t give honey to infants. What if I added a little alcohol to this, say Lillet or another fortified wine? Could I still use the water bath method? Life has kept me busy and I have a number of quickly ripening peaches. Thanks so much! Megan, I imagine it should be fine. Alcohol is a preservative, after all. Could you do mangos like this? I know you normally do local fruit, but I love mangos so much, I have 3 nice ones (about 2 lbs) they are so sweet that I hesitate to put in as much sugar as all the jam recipes say you need. Lily, Mangoes are not acidic enough to can on their own. I would not recommend doing this method with mangoes. I made this skillet jam today, but instead of lemon verbena, I added a couple of cinnamon sticks and the scrapings from a vanilla bean. Very yummy! What size jar is that in the picture? I imagine that it’s a vintage one but I love it and would love to find some. It’s an old, squatty pint jar. I really enjoyed this post as well. I’ve been meaning to buy canning equipment and learn how to can for the past two summers, but time and to a certain extent money has prevented me from doing so. This looks like something I could easily try without having to buy all the canning equipment. Thanks! That looks gorgeous. I just want it hot, out of the pan and poured straight over frozen yogurt or ice cream. I just whipped up a batch of this. 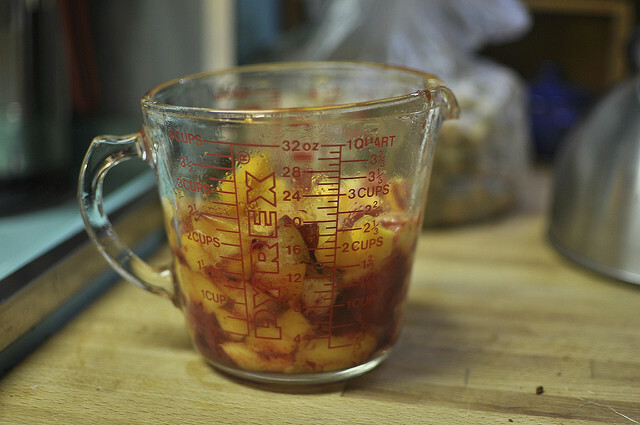 I had made conventional peach jam today and had leftover peaches and wasn’t sure what to do with them. I just chopped up about 3 1/2 cups of peaches and combined them with 1 cup of honey, a scant 1/4 cup of lemon juice, 1/8 teaspoon cinnamon and a teeny pinch of ground cloves. Put all of that in my big skillet and followed your lead. All I can say is YUM! I wound up with two 1/2 pint freezer jars and one 4 oz canning jar of the most delicious jam. It isn’t too sweet and I can taste the honey and lemon. I like it better than the big batch of peach jam I made this morning! Thanks from a newbie canner; couldn’t have been easier! I was completely inspired to step away from my laptop and cook some up. Posted pics to my FB, but I can’t post them here. I tried. Oh, and I added a piece of peeled ginger to the mix. OMG, the smell was phenomenal. Thanks for this post. I just used a couple of white peaches (that were never going to ripen) and a tiny bit of grated nutmeg to make skillet jam. I could have eaten that with a spoon–forget the toast or muffin! It got better after a couple of days in the fridge. Thanks so much. I have been reading your blog and loving it! Just made a double patch of this omitting the lemon verbena and adding 2 vanilla beans. Simply lovely result. Very pretty with all the vanilla seed flecks throughout. Just stumbled on your website and LOVE it. 🙂 And I already have a few recipes marked for trying out. 🙂 Can this specific recipe work with strawberries? Or would I need to add a bit of lemon? I just want to use less refined sugar, no pectin, and keep the fruit as fresh-tasting as possible. I imagine I’d need to boil in a water bath if I want to keep it shelf-stable, right? Thanks for this recipie! I whipped up a batch this morning with a few peaches from our farm trip that were going soft too quickly and we spread it over our French toast for brunch. Delicious. I will have to make more. Longevity was not a problem for us either. 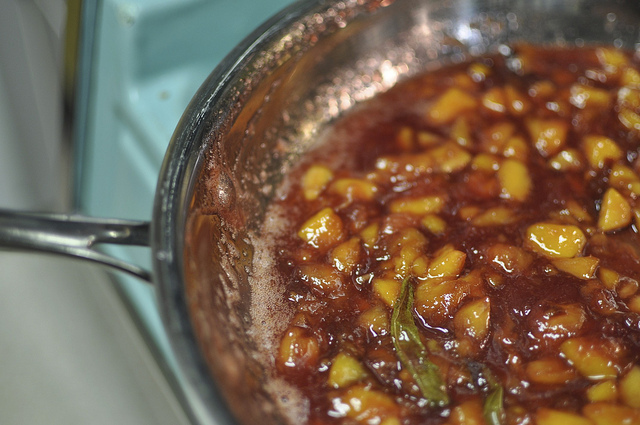 I whipped up a batch of peach and pear skillet jam last night. 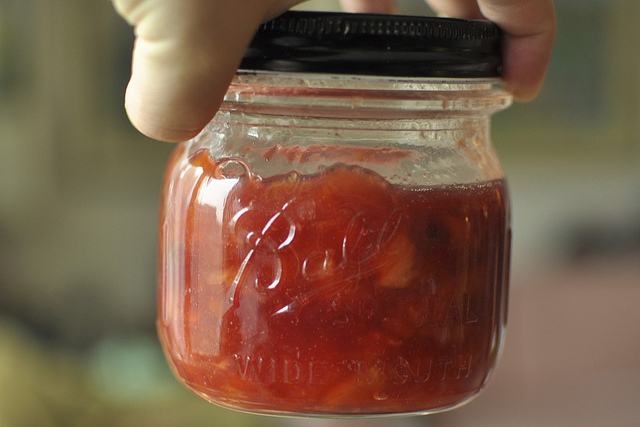 I put it up in sterilized jars (without the water bath), as I’ve done with jam, chili sauce, and pickles in the past. Since then I’ve read about skillet jams being kept in the fridge or frozen. I tested the seals this morning and they look good. My question: will this keep without being refrigerated or frozen? I used 5 cups of fruit (peach and pear, in equal-ish amounts), one cup of honey, and the juice of one lemon (also some grated nutmeg and lemon rind). I’d be happy for some advice. Many thanks, and I am thrilled to have stumbled across this site. Julia, it’s never a good idea to skip the boiling water bath process. All homemade preserves should be processed in a boiling water bath, including your jam, chili sauce, and pickles. It’s not that this jam is in any more risk of going bad than those other foods, it’s just an important part of the preserving process.